When I was a kid, one of my favorite things to do while visiting my grandparents was browsing through their collections of old National Geographic and Smithsonian magazines. I was more interested in the advertisements than the content of the articles. 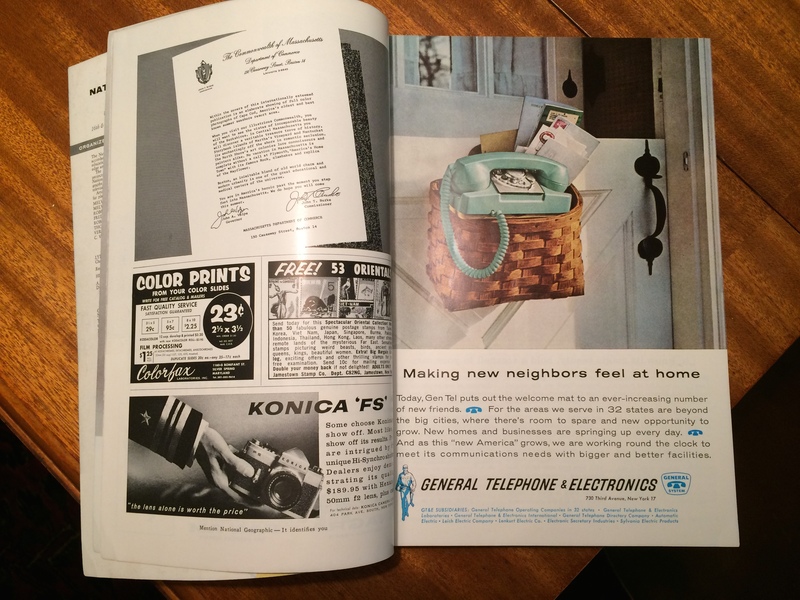 Most of the magazines were dated from the 1950s through the 1980s and they provided me with a glimpse into the world of my parents and grandparents from a time in the twentieth century I had missed. I also had a fairly obsessive interest in air-cooled Volkswagen Beetles, which had ceased being sold in the US shortly before I was born. They were still a common sight in the 1980s and something about their odd shape and the distinct beat of their air-cooled boxer engine captured my young imagination. 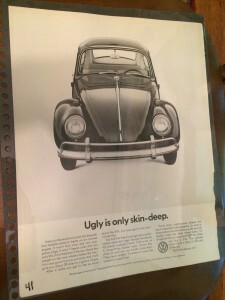 I was therefore delighted when an older cousin who had studied graphic design gave to me a collection of several hundred Volkswagen print advertisements that he had clipped from 1960s era Life magazines for a class project. Hinting at my future profession, I placed each sheet in a protective plastic sleeve, gave each one an accession number, and catalogued them in a spreadsheet. I think that part of the reason I find old advertisements so interesting is what they can reveal about our cultural past. Because advertisements are designed specifically to sell things, they can reveal the collective desires, values, fears, and anxieties of a culture. All of this to say, I love browsing the advertising collections at Duke Libraries. 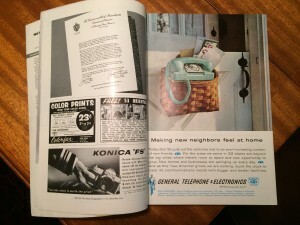 I’m especially fond of the outdoor advertising collections: the OAAA Archives, the OAAA Slide Library, and the John E. Brennan Outdoor Advertising Survey Reports. 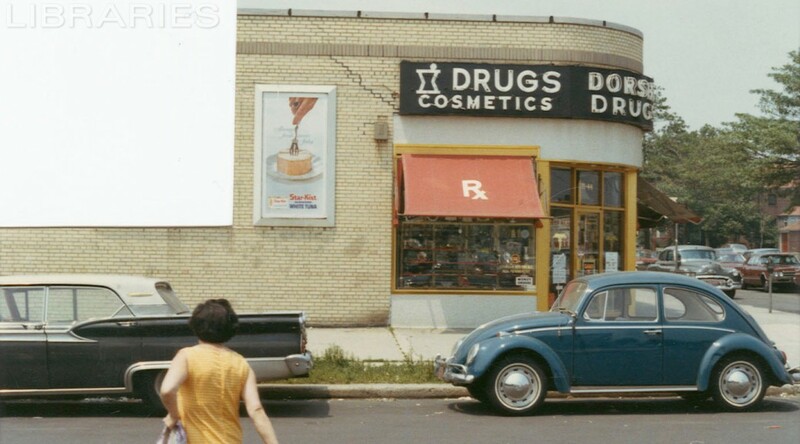 Because most of the items in these collections are photographs or slides of billboards they often capture candid street scenes, providing even more of a sense of the time and place where the advertisements were displayed. I’ve picked out a few to share that I found interesting or funny for one reason or another. Some of the ads I’ve picked use language that sounds dated now, or display ideas or values that are out-moded. Others just show how things have changed. A few happen to have an old VW in them. Part of my job as Digital Collections Program Manager is to manage our various projects from idea to proposal to implementation and finally to publication. It can be a long and complicated process with many different people taking part along the way. When we (we being the Digital Collections Implementation Team or DCIT) launch a project online, there are special blog posts, announcements and media attention. Everyone feels great about a successful project implementation, however as the excitement of the launch subsides the project team is not quite done. The last step in a digital collections project at Duke is the post project review. Project post-mortems keeps the team from feeling like the men in this image! Post project reviews are part of project management best practices for effectively closing and assessing the outcomes of projects. 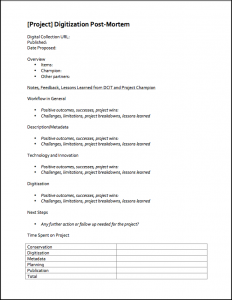 There are a lot of resources for project management available online, but as usual Wikipedia provides a good summary of project post-mortems as well as the different types and phases of project management in general. Also if you Google “project post-mortem,” you will get more links then you know what to do with. Document resources put into the project. In practice, this means that I ask the project team to send me comments about what they thought went well and what was challenging about the project in question. Sometimes we meet in person to do this, but often we send comments through email or our project management tool. I also meet in person with each project champion as a project wraps up. Project champions are the people that propose and conceive a project. I ask everyone the same general questions: what worked about the project and what was challenging. With champions, this conversation is also an opportunity to discuss any future plans for promotion as well as think of any related projects that may come up in the future. Once I have all the comments from the team and champion I put these into my post-mortem template (see right – click to expand). I also pull together project stats such as the number of items published, and the hours spent on the project. Everyone in the core project team is asked to track and submit the hours they spend on projects, which makes pulling stats an easy process. I designed the template I use as a word document. Its structured enough to be organized but unstructured enough for me to add new categories on the fly as needed (for example, we worked with a design contractor on a recent project so I added a “working with contractor” section). Seems like a simple enough process right? It is, assuming you can have two ingredients. First, you need to have a high degree of trust in your core team and good relationships with project stakeholders. The ability to speak honestly (really really honestly) about a project is a necessity for the information you gather to be useful. Secondly, you do actually have to conduct the review. My team gets pulled so quickly from project to project, its really easy to NOT make time for this process. 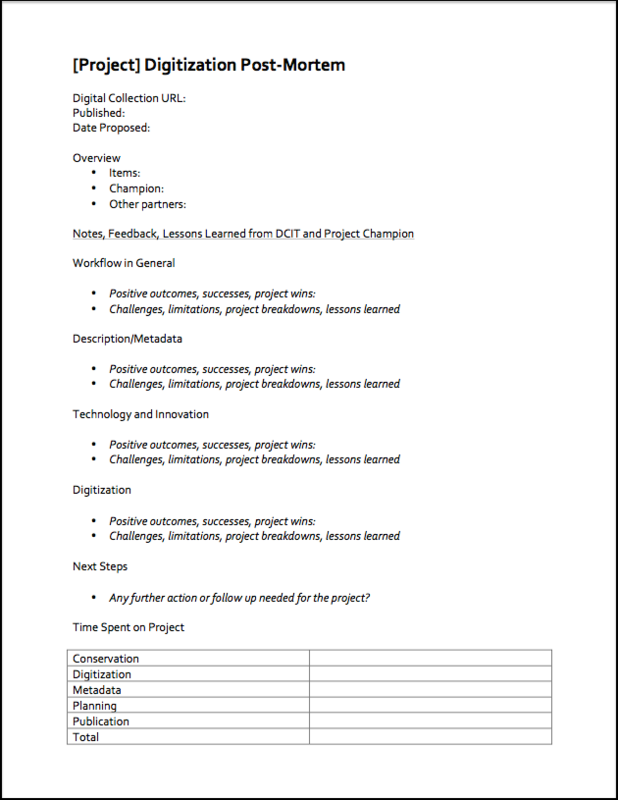 What helps my team, is that post mortems are a formal part of our project checklists. Also, I worked with my team to set up our information gathering process, so we all own it and its relevant and easy for them. DCIT is never to busy for project reviews! The impacts these documents have on our work are very positive. First there is short term benefit just by having the core team communicate what they thought worked and didn’t work. Since we instituted this in the last year, we have used these lessons learns to make small but important changes to our process. This process also gives the project team direct feedback from our project champions. This is something I get a lot through my informal interactions with various stakeholders in my role as project manager, however the core team doesn’t always get exposed to direct feedback both positive and negative. The long term benefit is using the data in these reports to make predictions about resources needed for future projects, track project outcomes at a program level, and for other uses we haven’t considered yet. All in all, I cannot recommend a post project review process to anyone and everyone who is managing projects enough. If you are not convinced by my template (which is very simple), there are lots of examples out there. Google “project post-mortem templates” (or similar terminology) to see a huge variety. Here is a blog post from California Digital Library on project post-mortems that was published in 2010, but remains relevant. As our long-term readers of Bitstreams will attest, the Duke Digital Collections program has an established and well-earned reputation as a trailblazer when it comes to introducing new technologies, improved user interfaces, high definition imaging, and other features that deliver digital images with a beauty and verisimilitude true to the originals held by the David M. Rubenstein Rare Book & Manuscript Library. Thus, we are particularly proud to launch today our newest feature, Smell-O-Bit, which adds a whole new dimension to the digital collections experience. A bold scent for a bold product, Pabst-ett cheese! Made by the Pabst brewing company while beer was off limits due to Prohibition, Pabst-ett cheese was soft, spreadable, and comfort-food delicious. We’ve selected a bold, tangy scent to highlight these comforts. The scent may make you happy enough to slap your own cheeks! The smell of late a night chess match. The smell of cigarette smoke, margaritas, and salt from around glass rims and chess players’ brows will make you feel as if you have front row seating at this chess match between composer John Cage and a worthy, but anonymous opponent. A scent strong enough to eat! You may feel yourself overwhelmed with the wafting scent of char-broiled deliciousness, but don’t forget to take a deep inhale to detect the pickles, ketchup, and mustard which makes this a savory image all around. Perhaps you smell garbage? If so, your Garbex isn’t working! What about flies, cats, or dogs? Or, perhaps you just smell a rat. Alright, you caught us. 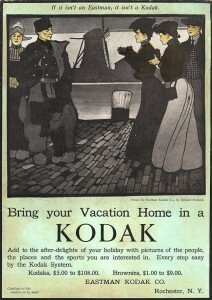 Happy April Fool’s Day from Duke Digital Collections! !